The following Apollonius Bibliography was compiled over the course of the past four years from my own personal library, messages from people on the Internet and information that I obtained through a search at the Google Internet Search Engine. The Google search found a total of 2,480 documents containing mention of Apollonius of Tyana, many of which were simply duplicates of others at different websites. When I reached item 762, Google indicated that these 762 were the most relevant and that other quite similar pages had been omitted, giving me a choice of continuing the search with the full list. Certainly, therefore, the following bibliography is complete in the sense that all of the most illustrious works about Apollonius of Tyana have been included. In addition to these primary works, Apollonius of Tyana has been mentioned casually in all sorts of miscellaneous articles that are catalogued online, many of which are electronic versions only. Although this current bibliography may be expanded or refined in the future, it is essentially complete at this point, as there are simply no other items which need to be included. Some of these bibliographical references note that the date is approximate or do not include a place of publication. This information could not be determined; and if any reader can assist me in refining this data, please send email. Your cooperation will be most appreciated. An asterisk * beside the date denotes that these writings were unfavorable to Apollonius by authors who attempted to debunk this "fiction" in defense of "the Jesus Christ". Undoubtedly, additional items in the bibliography are equally anti-Apollonius, but I have no information one way or the other about them. Also, quite a number of these older books have been reprinted in recent decades, though most of these reprint dates are not included here but can be obtained through Web searching by author’s name. This bibliography contains over 195 entries spanning the last 500 years. It does not contain any references to Apollonius of Tyana that can be found in various dictionaries and encyclopedias which have been published in numerous Western countries in the past. It also does not include any source of information about Apollonius prior to the republication of the Philostratus biography in Venice in 1501-1504. After the original publication of the Philostratus biography in 220 CE, the Council of Nicaea in 325 CE and the Edicts of Emperor Theodosius I in 381-389 CE, which made the dissemination of such information punishable by death, the Philostratus biography "officially disappeared" from history until 1501 when Aldus Manutius rediscovered it and published it along with numerous other ancient manuscripts, commonly known collectively as Rhetores Graeci. From that point until the present-day, all other attempts to censor or prohibit this book have been futile. Where this invaluable book had been hidden away for the thousand years prior to Aldus is, to date at least, unknown. A Gaul/Frenchman named Apollinaris Sidonius (now known in France as Saint Sidoine), who married the daughter of Roman Emperor Avitus, apparently saw the Philostratus biography around the year 460 and prepared an analytical treatise about it for Pope Léon I, including at one point making a comparison of sorts between Apollonius and Léon. Catholic Bishop Nemesius of Emesa, Syria, who is peripherally connected to the Emerald Tablet, wrote that he had met Apollinaris Sidonius, a meeting that most probably took place in Rome when Sidonius was the Ambassador from Bordeaux and during a visit by Bishop Nemesius to the "Holy See". But whether Bishop Nemesius discussed the Emerald Tablet with Apollinaris Sidonius cannot be determined. It should also be noted here that Bishop Nemesius was from Emesa, the hometown of Philostratus’ patroness, the "philosophical" Syrian Roman Empress Julia Domna, whose own father Bassianus was himself the High Priest of Emesa. Certainly then, Bishop Nemesius was aware of the history of Julia Domna’s involvement with the biography of Apollonius and possibly also the Emerald Tablet, which centuries later may have become known as "The Table of the Sun". Although I cannot say this with absolute certainty, as I have not yet seen this work, the 1932 French book by Maurice Magre, noted below, seems to link the saga of Apollonius to the Albigensians, a Gnostic Cathar cult that flourished in Albi, France, in the 12th-13th Centuries, until they were obliterated in the final medieval Crusade, the so-called "Albigensian Crusade" initiated in 1208 CE by Pope Innocent III and completed by his papal successors in 1244. And, curiously, Christian Rosenkruez (the pseudonym of Johan V. Andrea), founder of the Rosicrucian Order around 1614, is said by legend to have been buried on a mountain near Albi. In that meantime, 500-1500 CE, other than works by Arab alchemist and philosopher Jabir Ibn Hayyan (now known as "Father of Arab Chemistry") in about the year 800 CE, and a Spanish writer Hugues de Santalla (styling himself "Geber" after Jabir) around 1150, citing both Aristotle’s "Secretum Secretorum" ("Secret of Secrets") and Jabir’s work about "Balinas The Wise" (i.e., Apollonius of Tyana), very little, if anything, regarding Apollonius was published in either Europe or the Middle East. One of Jabir’s books was titled Kitab al-Hajar ’ala Ra’y Balinas (or The Book of the Stone of Balinas [The Wise]). Apparently, it is from the writings of Jabir and "Geber" that we have modern knowledge of the "Emerald Tablet" ("Tabula Smaragdina") that was first attributed to Aristotle in his "Secretum Secretorum" which Hugues de Santalla translated from Arabic into Latin. For more information, the reader is referred below to the 1942 publication by Paul Kraus in Cairo, as well as the 1994 preface by D. Kahn, the 2000 article by Françoise Hudry and the more obscure 1798 document by Pierre Samuel Sylvestre de Sacy, all published in Paris. I also refer the reader to my own companion treatises titled "The Synchronized Chronologies of Roman and Related Histories" and "The Aldus Preface". Parenthetically here, my work on this bibliography has undergone extensive revision and updating as the months have passed. Recently last March 2002, Professor David Armstrong of the University of Texas at Austin completed a translation from Latin/Greek into English of the preface which Aldus Manutius wrote to accompany his publication of Philostratus’ biography of Apollonius. Professor Armstrong’s work is an original translation commissioned by me, the first ever (that I know) of this Aldus preface into English. Simultaneously, Professeur François Gadeyne completed the first known modern French translation of the preface, which translation is not available here. This preface is analyzed in greater detail in another essay. However, it can be noted here that in 1501 Alemannus Rhinuccinus completed his translation of Philostratus’ Life of Apollonius; but Aldus postponed its publication for three years until after Friar Zanobi Acciaioli (addressed by Aldus as "Zenobius") of the San Marco Monastery Library in Florence could complete his new translation of Bishop Eusebius’ Contra Hieroclem, which Aldus stated in the preface was "the antidote to the poison" of the liar Philostratus. Also, Aldus opened his preface by noting that the translation by Alemannus Rhinuccinus was the fourth translation into Latin, since (apparently) the Fifth Century contact between Apollinaris Sidonius and Pope Léon I in France. Thus, between the time of "Saint Sidoine" and Aldus, a period of one thousand years, three "lost" translations of this biography were completed; and Aldus knew about them all, but Aldus did not record for posterity’s sake exactly who undertook these three translations. Here, for the record, is my personal modern rendition of the translation of the Emerald Tablet. 1) Here is a true explanation, concerning which there can be no doubt. 2) It attests: As Above, So Below -- the work of the miracle of the One. 3) And things have been created from this primal substance through a single act. How wonderful is this work! It is the main principle of the world and is its maintainer. 4) Its father is the Sun and its mother, the Moon. 5) The wind has borne it in its body, and the Earth has nourished it. 6) The father of talismen and the protector of miracles whose powers are perfect, and whose lights are confirmed. 7) A fire becomes Earth, so separate the Earth from the fire, and thereby attain the subtle over the gross, with care and sagacity. 8) It rises from Earth to Heaven, so as to draw the lights of the heights to itself, and descends to the earth; thus within it are the forces of above and below. 9) Thus wilt thou partake of the light of the world, and darkness will flee from thee. 10) This is the force of forces, which overcomes every subtle thing and penetrates into all that is gross. 11) The structure of the microcosm is in accordance with the structure of the macrocosm. 12) And accordingly, the arrangements to follow this road are hidden. 13) And to this, aspired Hermes, who was thrice graced with majestic wisdom. 14) And this is his last book, which he concealed in this chamber. Although when I began this introduction to the bibliography, I did not intend to include a discussion of the Emerald Tablet, it now seems appropriate to place it here, for to a certain extent the Emerald Tablet was the origin of all that followed. There has been debate as to the meaning of the world "emerald" in this context. Certainly it does not mean that this tablet was inscribed upon a large stone of pure emerald. Such a stone could not exist. 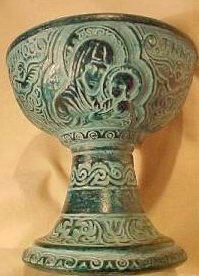 Thus, people have suggested that it was inscribed on jade, not emerald. To me, this also seems a bit illogical, as jade like emerald is a precious jewel, not a rock or stone, like limestone or granite, for example. During my 1998 trip to Greece and Turkiye, I saw some areas where the rocks that lay on the ground were green in color, compared to, say, the sandstone rocks of Oklahoma which are usually reddish or white. There are rocks of all colors all across this planet. Thus, it is entirely possible that this brief "Book Of Hermes" could have been carved upon a tablet that was fashioned out of some of this Greek/Ionian green rock; and the word "emerald" or "smaragdina" would refer to the greenish color of the stone only -- not intending to imply the rarer jewels of emerald or jade. In mid-2002, the following JPG was sent to me by an e-friend in a different context than Apollonius. However, it reaffirmed my own idea that this "Tabula Smaragdina" could have been fashioned from emerald-green rocks like these. 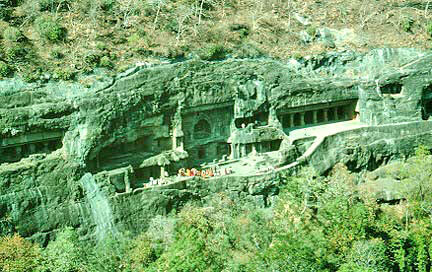 This green-rock temple-cave complex is located at Ajanta, India (below image), about a two-hour drive east of modern Bombay (Mumbai), in western India. This is not too far off the route that Apollonius and Damis travelled south from Taxila after visiting the Iarchas and the Sages in the western Himalaya Mountains. If you search on the Web for "Emerald Tablet", you will also find references to "Emerald Tablets" (plural). There is a series of 17 of these tablets, which are quite long by comparison to this single Tablet of Hermes. These other "tablets" discuss some of the writings found in the so-called "Hall of Amenti"; and even though they are interesting in and of themselves, they are not the authentic "Tabula Smaragdina" of Hermes, obtained by Apollonius from the Cave of Trophonius. What they really may be, I personally do not know. Also in mid-2002, I obtained information regarding the difference between the single Emerald Tablet of Hermes and these other 17 essays, i.e., "Tablets" plural. These 17 later tablets were based upon the ideas of the single Emerald Tablet and are known collectively as "Corpus Hermeticum". Aristotle was the teacher of Alexander The Great, who may have brought the Tablet from Egypt or Babylonia to Greece, perhaps on the actual advice of Aristotle. Then later still, the Tablet was attributed to Apollonius of Tyana, who probably retrieved it from the Cave of Trophonius about 100 kilometers northwest of Athens, or perhaps from the Cave of Orpheus in Thrace. Subsequently the Tablet was donated to or acquired by the personal library of Roman Emperor Hadrian in about 120 CE, 23 years after the death of Apollonius. Where this Tablet is located today is anyone’s guess; but again, curiously, it is rumored to have been hidden away a final time in Christian Rosenkruez’s mountain tomb at Albi, not too far away from Avignon, where the Holy See was headquartered during the 1300s, when the original "Mandylion" (now known as the Shroud of Turin) was brought from Constantinople to France in 1356. There has been speculation amongst various people, including myself, that what was known as "The Holy Grail" (which some have also equated with the legendary "Philosopher’s Stone") was in fact the Emerald Tablet. The Holy Grail was supposedly a goblet that was used to collect drops of blood from the crucified Christ before he "died". An Internet friend in Australia referred me to a website where this "Holy Grail" is depicted as being "emerald green" in color. Whether this "coincidence" alone allows for an identification of the two as one and the same has not yet been determined. Recently new excavations have begun at Tyana (modern Kemerhisar) in Turkiye, an effort by scholars to unearth what may remain of this ancient cultural and commercial center, which was founded in approximately 825 BCE by Assyrian Empress Semiramis Tuvannanas and Hittite-Cappadocian King Nimrod. Because of the linguistic similarity between the two words "Tyana" and "Tuvannanas", we may infer that perhaps the city was named after Empress Semiramis Tuvannanas. We shall have to wait and see if the Emerald Tablet, or anything else of significance to Apollonius, is discovered in the ruins of old Tyana. "It would be endless to enumerate all the works that have been written in whole or in part regarding this life of Apollonius. An examination or notice of them will be found in the prefaces of Olearius and of Kayser. The work itself was first published by Aldus, 1501, Venice, fol., with a Latin translation by Alemannus Rhinuccinus, and along with it, as an antidote, Eusebius, Contra Hieroclem. The other editions having this work contain the whole works of Philostratus, as will be mentioned afterwards. "The life of Apollonius (with a commentary by Artus Thomas) was translated into French by Blaise de Vigenère, 1596, 2 vols. 4to., and repeatedly republished, the translation being revised and corrected by Féd. Morel, one of the editors of Philostratus (Bayle, art. Apollonius Tyanaeus). "A translation of the two first books, with notes professedly philological, but only partly so, and partly containing a commentary of bitter infidelity, was published in London, 1680, fol. The translation, and probably the philological notes, both of which evince much reading but not accurate scholarship, are by Charles Blount, whose tragical end is told by Bayle. The other notes were partly derived, it is said, from a manuscript of Lord Herbert. This translation was prohibited with severe penalties in 1693, but was twice reprinted on the Continent." Let me express my profound gratitude to my Apollonius research colleague Nicolas Verger in Bordeaux, France, for his invaluable and untiring assistance in compiling this unprecedented chronological historical bibliography. "Grandfather of the Paperback Book"
1798 "Le Livre du Secret de la Créature par le Sage Bélinous"
1860 Commentatio qua de Philostrati in Componenda Memoria Apoll. Tyan. 1879 "Apollonius von Tyana der Heiden Heiland, ein Philosophische Studie"
1992 "Eusebius and the Posthumous Career of Apollonius of Tyana"
1994 "Stradanus Drawings for the Life of Apollonius of Tyana"
1996 "The Exorcisms of Apollonius of Tyana and Jesus of Nazareth"
1998 Apollonius of Tyana : The Monkey of Christ? Traduction latine par Hugues de Santalla du "Kitab sirr al-haliqa"
"The Synchronized Chronologies of Roman and Related Histories"
2002 "Apollonius of Tyana : Chronological Historical Bibliography"
For the original Latin/Greek Aldus Preface, courtesy of Professor Roberto Espinosa of Brigham Young University in Salt Lake City, Utah, please click here.